A new rector has been called to the Episcopal parish of St. Luke the Physician in Gresham, Oregon. When the Rev. Sara Cosca Warfield begins serving St. Luke’s parish in March, she will have been ordained a priest for more than one year. For two years prior to her ordination, her ministry has been as a street chaplain to people who are unhoused in the Tenderloin and Mission districts of downtown San Francisco. Prior to ordination also, she worked for several years with an organization serving unhoused people in New Haven, Conn.
A Wyoming native, Rev. Sara met her wife, Rachel, in seminary. They were married in May 2018. Rev. 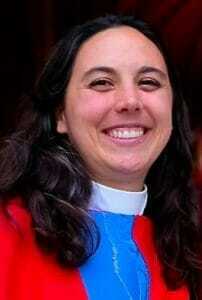 Rachel is an ordained minister in the United Church of Christ. Rev. Sara’s undergraduate work was in journalism and creative writing at the University of Bridgeport in Connecticut. She earned a Master’s of Divinity at the Pacific School of Religion (seminary) in Berkeley, California. An interim priest served St. Luke’s for nearly two years while the parish searched for a new rector.